Implants are superior to bridges and dentures in that they don’t damage your other teeth. Placing a dental implant does not negatively impact any other tooth in your mouth. On the other hand, placing a bridge means that you have to sacrifice and shave down two teeth at a minimum. While a bridge may work out and last forever, there is always the chance that something may go wrong. Should your bridge fail, you typically lose one additional tooth as a result and now you need one more implant. In fact, many patients with missing teeth had their problems initially start off with a failed bridge which created an avalanche effect of tooth loss. Dentures can also damage your other teeth. Typically, partial dentures damage the anchor teeth which they clip onto. Denture claps stress these anchoring teeth and gradually loosen them or create cavities on these teeth. Bridges and dentures can both cause you to lose more teeth over time but dental implant don’t impact your remaining teeth. 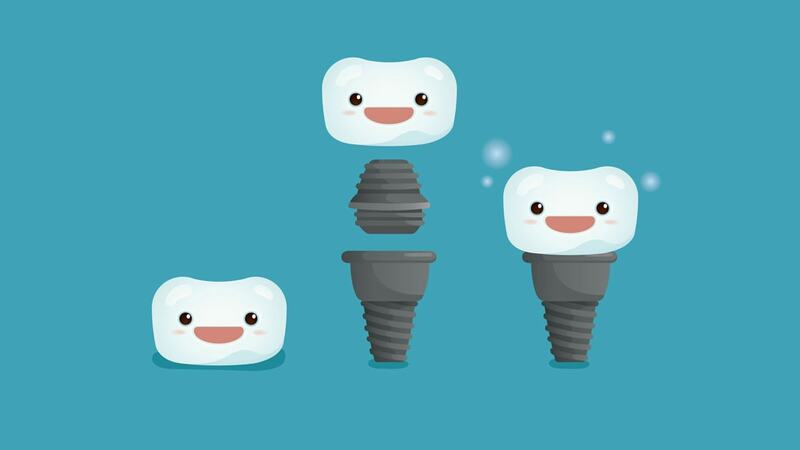 Investing a bit more into dental implants can actually save you time and money in the long run. A successful dental implant could easily last you a lifetime whereas a bridge is a gamble. After all, there are two anchor teeth which can go bad at any time and no guarantees could be made that they won't go bad either. Many bridges fail after just a few years and need to be replaced with additional dental implants. In fact, you may find yourself spending much more time and money on a failed bridge then what a dental implant would have cost in the first place. The same goes for dentures. Denture teeth break, become loose, irritate your gums and dentures last far less than dental implants do. Most dentures require replacement every few years as they break, wear out or start irritating your gums whereas dental implants typically last a lifetime. Dental implants are much easier to clean as compared to bridges and dentures. You clean dental implants as you would any other tooth in your mouth by simply brushing and flossing the implant tooth. Cleaning bridges is difficult and requires a special floss which is very challenging to maneuver. Dentures tend to trap food and develop a calcified layer if they are not removed from your mouth and cleaned periodically. To learn more about cleaning and maintaining dental implants, click here. Dental implants provide for a more natural look, improved function, better speech and are all around a better prosthesis as compared to both bridges and dentures. You can chew and bite on dental implants with full efficiency as you would on your own natural teeth. In fact, chewing capability on a full set of dental implants is about 4 times greater as compared to a full set of dentures, which is very significant. This is probably my favorite benefits of receiving dental implants as compared to bridges and dentures. If you have teeth missing, your jaw continues to shrink over time and you gradually lose jawbone. Dental implants preserve your jawbone the same way natural teeth do by signaling your body to stop the resorption process. In fact, your body can not tell the difference between a natural tooth and a dental implant and it keeps remodeling bone around the implant to keep the implant in place. The result is that dental implants help preserve your jaw and face making you look and feel healthier, stronger and more youthful. On the opposite hand, neither a bridge nor a denture does anything to preserve your jawbone. In fact, dentures actually accelerate bone resorption due to the stress which they place onto your jaws. Implants are a fixed, permanent solution, which means that they do not come in and out of your mouth the way that dentures do. A bridge is also a fixed solution, so this benefit only pertains to denture teeth. I don't want to promise you that you'll never face a problem with dental implants as implants can fail, become loose or face other problems. However, an experienced implant dentist can fix all these problems for you. Make sure you find a good, experienced implant dentist and be mindful that complications are rare but when they do occur they can typically be resolved over time. Costs is the biggest barrier to receiving dental implants. The reason that implants are so expensive is because of the cost of their physical parts, required training and treatment times, which all adds up. If you are looking to get dental implants, by all means shop around to look for a good bargain, however avoid places that advertise cheap implants. Implant failure is much higher with these bargain implant clinics and are simply not worth it. It's true, dental implants do take longer to complete as compared to alternative treatment options. Most implant treatments take 6 to 9 months, although it is not uncommon to receive a temporary tooth the same day or for other treatment to take 1 to 2 years. Treatment times vary based on your condition, bone quality, healing time, clinician skills and other related factors. Regardless, treatment time should not be a factor when it comes to making your decision under normal circumstances when making the decision to receive dental implants. Instead, consider if the benefits of receiving dental implants to you justify its costs. Dental implants are typically your best overall option for replacing missing teeth. Dental implants give you the equivalent of an entire fixed tooth without the need to damage any other teeth. If you can afford them, you should choose dental implants over bridges and dentures. No other dental treatment can give you results as good as dental implant when you consider the benefits of implants. If you live in Southern California and want to learn more about whether or not you are a candidate for dental implants, schedule your complimentary consultation with Dr. Jazayeri at his San Clemente office.